Russian Marine Clock In for repair is a Russian Marine Clock. The clock would not run, initial observation showed the clock mainspring was completely wound up. The next thing checked was the platform escapement. The balance seemed undamaged and free. It was not overbanked. The next thing checked was dirt and grime around all the wheel pivot points. Everything looked OK. Checking pivot holes, they seemed dry. The clock movement was oiled with high-grade clock oil and hi-grade watch oil on the escapement. The clock took off. This clock has some characteristics of a carriage clock. Most carriage clocks have a crown wheel that connects to the platform hairspring escapement. In for repair is an oak octagon wall clock reproduction with an Jauch time and strike movement. The case was well done made of white oak. A nice looking clock. The clock did not run when it was brought in for repair. This is a picture of the right side of the back of the movement. Notice the two pivot holes with gobs of dirty oil and the drip of dirty oil coming from the top pivot hole. Seeing this kind of dirt in the pivot holes is a good indication of pivot hole wear and possibly pivot wear. 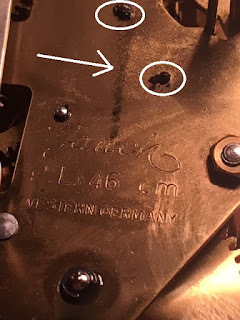 The movement was disassembled and the pivot holes were worn. The pivots were surprisingly is very good shape. These did not have to be polished. New bushings were installed in these two holes and sized to fit. In total, there was 6 pivot holes needed bushing work.